This year Rotaract Club Treviso has decided to devote completely to the prevention and the struggle against the violence on women and children, an actual and very delicate topic. The Rotaractors, together with their Interact, have planned different initiatives that will serve to sustain an only great service that will reach conclusion in June 2019. The service foresees the donation to the hospital of Treviso of a room devoted to welcome women and children that have suffered actions of violence. It deals with an environment endowed with a modern machinery, useful to analyze the vital parameters of the victims in a non-invasive way. The project has been welcomed with enthusiasm by the ULSS2 of the Veneto Region, that already had in calendar some initiatives about this topic. Particularly, the service of the Rotaract will make the pair with the course that the Sanitary firm is organizing for forming its own personnel and to create a team devoted to furnish help to the victims of violence. In order to reach the ambitious economic objective (around € 10.000 for the purchase of the machinery and to furnish them some spaces), the Club will help with different initiatives. The first event will take place on November 4th 2018. 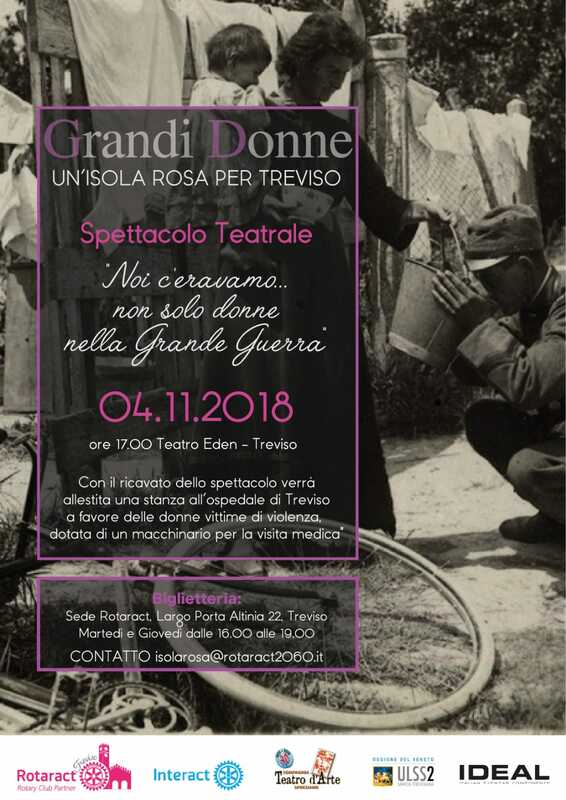 In the day of the centennial of the “bollettino della vittoria “, the boys have organized to the Theater Eden ( in Treviso) a show from the title ” Noi c’eravamo… non solo donne nella Grande Guerra “, that will tell the fundamental contribution that the women gave during the first world conflict. In December, then, a supper will be organized with the pilots of the “Frecce Tricolori”, whose drawn will entirely be devolved to the service. Another source of proceeds will come from the joined fund for Rotaract and Interact made by the Rotary Club Treviso Terraglio for the projects among those Clubs. The contribution of the Interact will be also, in fact, conclusive for the attainment of the preset objectives; they will contribute with some sales of cakes in the city.